If you read our last blog post, the Idea Center Team believes that we should give back. What better time to leverage the power of the web to make a difference than during Giving Tuesday? Giving Tuesday is a one-day international movement on Tuesday, November 29, 2016. Charities, businesses, students and people around the world celebrate and encourage giving to nonprofits on the Tuesday following Thanksgiving, Black Friday, and Cyber Monday. The online event kicks off the charitable giving season and can help nonprofits reach a larger online donor audience. Last year, 700,000 people joined together to donate more than $116 Million on Giving Tuesday! The Idea Center recently launched CARITAS‘s newly designed website. The WordPress platform has allowed The Idea Center to help the Richmond nonprofit prepare for Giving Tuesday and the holiday giving season in a number of ways. 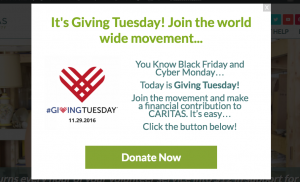 CARITAS used its donor software, Donor Perfect, to create a unique branded donation form for Giving Tuesday. The Idea Center helped CARITAS embed the form on a web page dedicated to the one-day event. CARITAS will guide its social media followers and newsletter recipients to this page via scheduled posts and emails. The page will move into draft mode after November 29 and be ready to go for next year or serve as a template for other short-term fundraising campaigns. Action bars and pop-ups are used to generate leads and create calls t0 action on websites for successful businesses and blogs. The effective marketing tool has come in handy for short-term opportunities for CARITAS such as Giving Tuesday. The Idea Center team installed the Icegram plugin to help CARITAS easily create simple and customized pop-up calls to action. After Giving Tuesday, another pop-up form is scheduled to to go live. It will focus on the CARITAS Holiday Alternative initiative, which allows donors to send cards to their loved ones in exchange for a donation. How is your business or organization preparing for the holiday shopping and giving season?